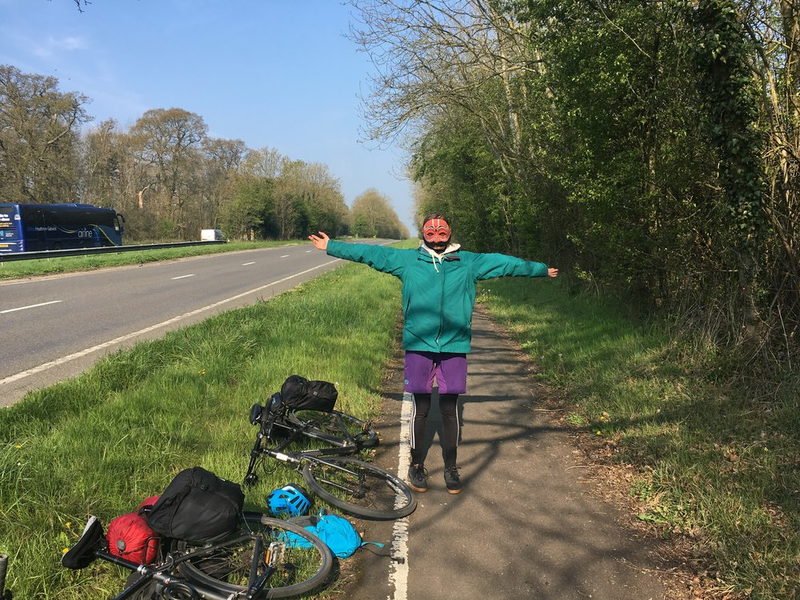 Incredible Karna, hosted by Olive Supple-Still, has just completed a cycle tour from Liverpool to London covering more than 180 miles. 42 people have been supporting the tour and therewith the Kattaikkuttu Gurukulam bringing together a total amount of ₤ 1000. We are so touched by the physical accomplishment that equals Kattaikkuttu’s all-night performaces. A big thank you to Olive and her companion on the bike, Will Lang! Prior to his long bike ride, Karna visited cold Canada where he stayed with Sydney Thurn and Shaunvir Sidhu. Thee treated him and his supporters to a choice of delicious Indian dishes — home cooked by Shaunvir’s Mum — and collected Can$1200 in support of the school. Karna is now on his way to the USA where he will be hosted by Katie Norman (May), Kate Donahue (June 2019), Keely Burke (July), Britta Tollefsrund (August) and Natalie Osborne. We are sure that these strong and creative ladies have a series of surprises for Karna and for us! Please continue to follow his adventures here. What did he see So far? Over Diwali 2018 Karna visited the home of one of the students of the Kattaikkuttu Gurukulam. Prior to his world-wide travel Karna visited the Kattaikkuttu Gurukulam to experience the daily life of its students and staff. Over Diwali he accompanied some of the students and volunteers to their villages. You can see what he saw here. With thanks to Rebekka Gather and Hannes Langanky. Masha Dimitri shows Karna her world in front of Teatro Dimitri in Verscio, Switzerland. Masha taught a comedy workshop at the school in 2011. The Kattaikkuttu Gurukulam has a long standing relationship with the Accademia Teatro Dimitri and we have exchanged students and graduates and artistic expertise. Karna has traveled to Manchester, UK, where he was with Hebe Reilly. Hebe taught English and physical theatre at the KKG in 2011. She now runs her own yoga studio. You can look at what Karna saw in Manchester and read his experiences here. Karna very briefly visited Amsterdam where Ruth de Bruin sold home-made quince jelly on his behalf. Karna’s fund raising has many forms. We were deeply touched when Ruth Hungerbühler let us know that her father, Xaver, had died and that she had requested her family and friends to donate to the Kattaikkuttu Gurukulam instead of buying flowers on the occasion of his funeral. Xaver was a teacher and deeply concerned about the fate of disadvantaged young people. In addition to teaching formal classes to students with learning difficulties, he taught his students also in artisanry to equip them, like the students of the Kattaikkuttu Gurukulam, with both academic and practical-vocational skills. Ruth hosted our graduate student S. Tamilarasi when she did a three months internship with Accademia Teatro Dimitri in Verscio, Switzerland, in 2014. At that time she met Xaver and spoke with him about the Kattaikkuttu Gurukulam. We like to believe that the money raised during his funeral are the flowers that will enable and enhance the lives and careers of our young students. Karna was with alumni volunteer Enrico Nivolo and his family and friends in Italy. Enrico is an anthropologist with an interest in theater, comedy and - at a practical level - acrobatics. The Gurukulam students remember him fondly as “Enrico Sir”, who taught them acrobatics from Oct 2015 to April 2016. When I was asked to take part in The Eyes of Karna fundraising program for the Kattaikkuttu Gurukulam (KKG) I didn’t think twice. My time at the KKG was one of the most magical and rewarding of my life. The people, the culture of the organisation, the landscapes and the opportunities for my own growth and learning were (are) all simply amazing. The chance to continue that relationship was a welcome challenge. After reading about the project, I took some time to refresh my understanding of Karna. While teaching at the KKG I had the chance to see Rajagopal and the KKG Young Professionals present the all-night performance depicting Karna’s life and death; Karna Moksham, a number of times. My memories of watching these performances, leafing through Hanne de Bruin’s translation into English stand out in ways that differ from the heightened excitement of Dice and Disrobing or Kuruvanchi. Perhaps having the text to guide me provided a more intimate understanding of the story, or perhaps the story itself is more intimate, more moving and, even at its’ climax, more heart wrenching than the others. Most memorable was a performance undertaken at the passing of one of Rajagopal’s own relatives. Sitting with family in the village of Ayyangarkulam was moving in ways I struggle to explain, but fiercely cherish. Reading up on Karna and his battles and then taking time to reflect on how such a mistreated and heroic character might relate to my own life has given me a shock. I have moved through reflecting on Karna as a true hero: Born into poverty, disowned by his young, royal, mother and father (a God!) and taken in by a lowly cart-man and his wife Karna is never-the-less, the most selfless character in the Mahabharata. How would this man, who was prepared to give up everything to find eternal freedom, at the very time when his earthly consorts are finally offering him acceptance view my life? I think about this and I realise just how privileged and lucky I am. In many ways, I think of myself as a good person. I work in the environmental field. I volunteer. I spent close to two years volunteering at the Kattaikkuttu Gurukulam. I am nice. When I consider my life and perceptions of myself through the mask, through the Eyes of Karna I understand that all of this is a by-product of the privilege I have been lucky enough to be born into. I had opportunities. Good education, a stable and loving middle class family in a wealthy country. I am able to travel on an easily obtained passport that no one really questions. Ever. I have a job that I find challenging and rewarding. And I am paid well for my effort. I was able to save some money and take time out of what many see as ‘real life’ and spend an incredibly valuable and rewarding time at the Kattaikkuttu Gurukulam. I was paid in memories and lessons that are irreplaceable. This leads me to where I am now. An experience that keeps on repaying and rewarding. I look beyond Karna. I think about all the underdogs in the world and how they might view my life. The indigenous Australians who have been dispossessed and find themselves surrounded by the wealthy off-spring of colonialists, convicts and free immigrants looking for a new life. The countless refugees seeking peace, safety and their own freedom, being turned away from borders all around the world. Being turned back to poor underdog nations who house them in sprawling tent cities. The many people who did not get the lucky breaks, who can’t make ends meet. Financial ends or otherwise. I think about the wonderful children I met at the KKG who sat quietly and shared their personal underdog stories with me. Many bringing a knot to my throat and tears to my eyes. Before they ran off to play cricket or practice their music or dancing. They showed me a tenacious spirit, that I can only hope I somehow caught. Small children sitting through days full of lessons and training, then studying into the night. Working for a new life, not just for themselves but their families. And for the theatre they love and so proudly represent with such talent and skill. In the end, Karna’s Eyes and the Kattaikkuttu Gurukulam with all its’ students and wonderful, self-less teachers give me hope. Hope for something better for a small and powerful group of underdogs I will always love. Enid Still is from Scotland, but now lives in the small city of Passau in Germany where she works on a complex anthropological Ph. D. research project. In 2014-2015 she was the super-efficient volunteer business manager of the Kattaikkuttu Sangam and Gurukulam. In this capacity she helped out organising the 25th anniversary of the organisation. Enid invited her friends to collaborate with her. 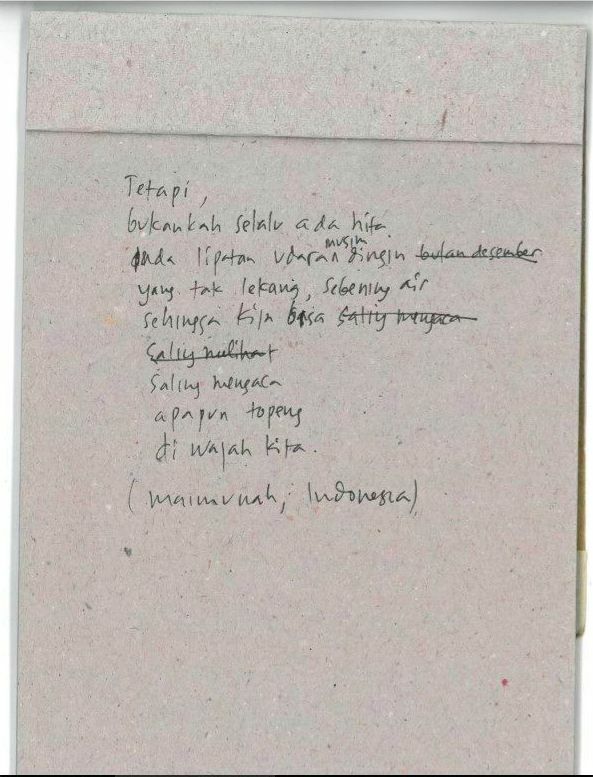 Below you find four poems that reflect on Karna’s situation as an underdog from four different corners of the world and in four different languages (English, Bahasa Indonesia, Spanish and Italian). Of which we already know. 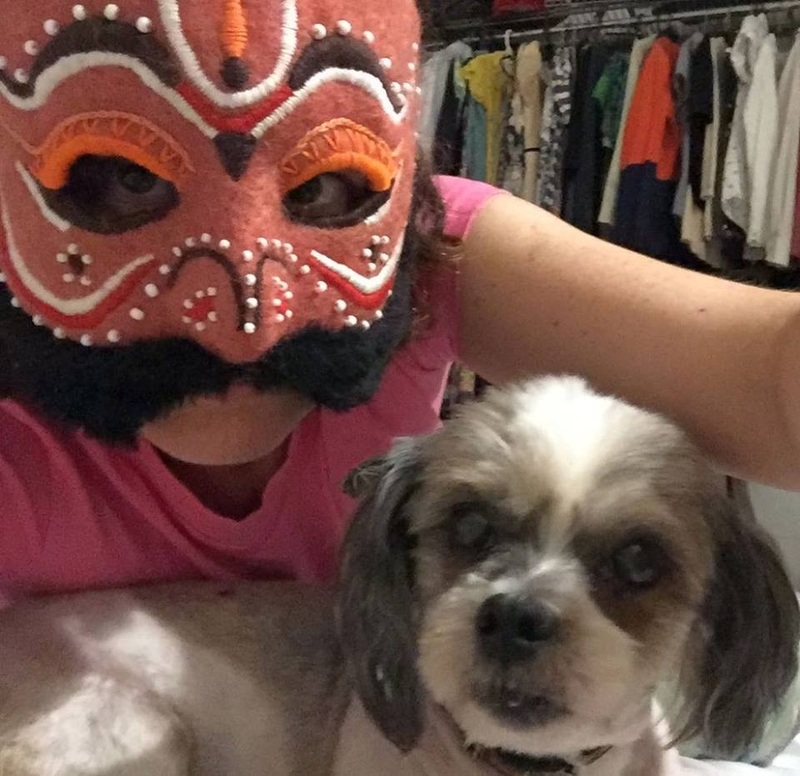 Whatever mask is on our face. Watching life pass you by. So stop questioning and let yourself go. Dust is what we become. How much did karna fund raise? 48% raised of our desired end goal of € 25.000 and yet another 6 1/2 months to go!